We are developing a series of Regenerative Farming education programs including tours designed to allow people interested in developing their farm or business, to visit and learn from a range of regenerative farming and food distribution business in Australia and around the world. We work with local owners, educators and consultants to provide training workshops as part of the tour programs. Each visit is specifically targeted to provide you with not just a casual view of an operation, but an in-depth look at the what, how and why. We aim to broaden your knowledge, link you with others and give access to people and networks that can help you. We also seek out experts to bring new ideas and concepts and provide opportunities to get a first look at these ideas and learn how they can be applied to your situation. In 2012 we ran our first program to the USA – Sustainable Food & Farming Tour USA. This trip started in New York following on through Vermont, Pennsylvania, Virginia and then onto California. 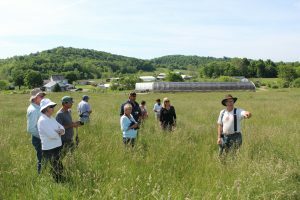 The visits covered Rodale Organic Institute, Polyface farm, Hardwick Centre for Agriculture Economy, Amish farming enterprises and much more.